It was no mystery that Kawneer wanted to play a strong role in putting together the greenest building in its own neck of the woods. Detail of the Kawneer 1600UT System Curtain Wall shows (from outside perspective) how triple-glazing fits into the mullion. Image courtesy Kawneer. 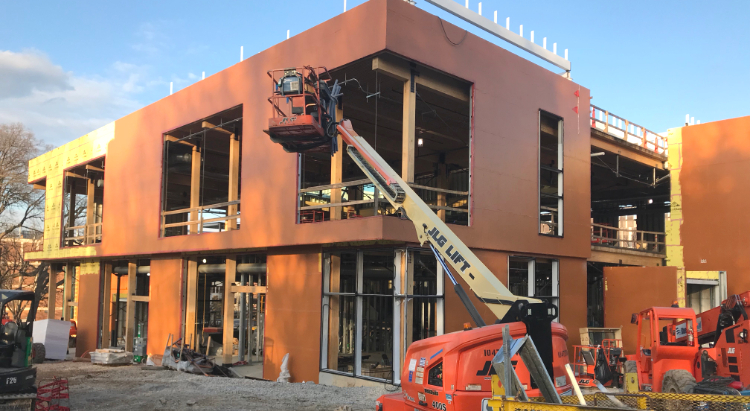 The suburban Atlanta aluminum building products manufacturer had worked hard to distinguish its storefront framing, entrances, specialty windows and bread-and-butter curtain walls as sustainable. Eleven of the company’s products have earned Declare labels, and all of those are free of toxic Red List chemicals. Photovoltaics are even integrated into one line of Kawneer’s curtain walls. And, in 2016, as design got underway on the Kendeda Building for Innovative Sustainable Design, engineers at the company’s Norcross, Ga., headquarters had already developed their most energy-efficient curtain wall yet — the 1600UT System. 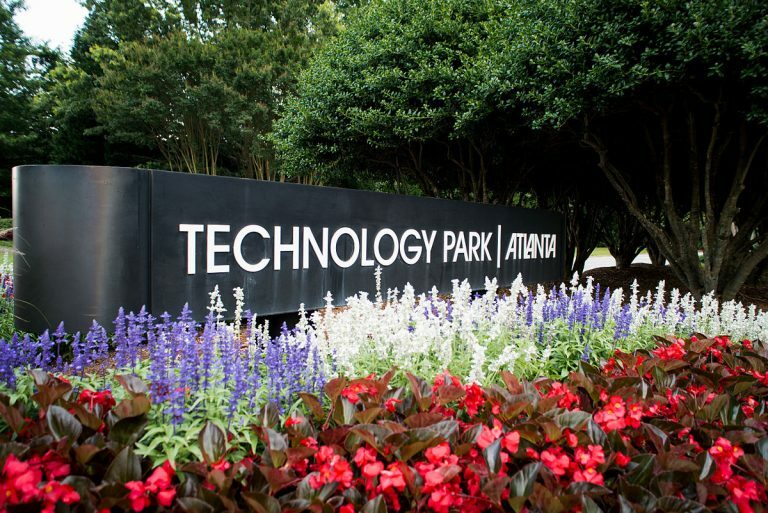 Not surprisingly, Kawneer took a keen interest in the high-profile, deep-green project on the Georgia Tech campus. Jenelle Sams, who at the time was a sustainability specialist for the company, became a regular attendee at design team meetings that were open to the public — partly to gain a better understanding on how to best adapt products and systems to the Living Building Challenge, partly to keep the company’s name top of mind for the project’s architects. Because they mainly contain glass and hollow metal frames, curtain walls often are a weak link in the insulated envelope around an energy-efficient building. That means there’s plenty of room for improvement. But Hunter stresses that Kawneer’s ongoing development of curtain wall systems that meet increasingly challenging sustainable standards made an additional step to the 1600UT System — the UT stands for “ultra-thermal” — relatively easy. “We just increased the thermal break that was already in place,” Hunter says. A slight change in the standard configuration of the product increased the thermal value by 6 to 8 percent without altering the overall profile of the installation, according to Hunter. More importantly, the 1600UT mullions can provide spacing for triple-paned windows; that can increase the thermal performance of the overall window by a much larger factor. The ease with which Kawneer tailored its system to meet the stringent specifications of the Living Building Challenge speaks to the head start Kawneer enjoyed by placing a strong emphasis on sustainability. 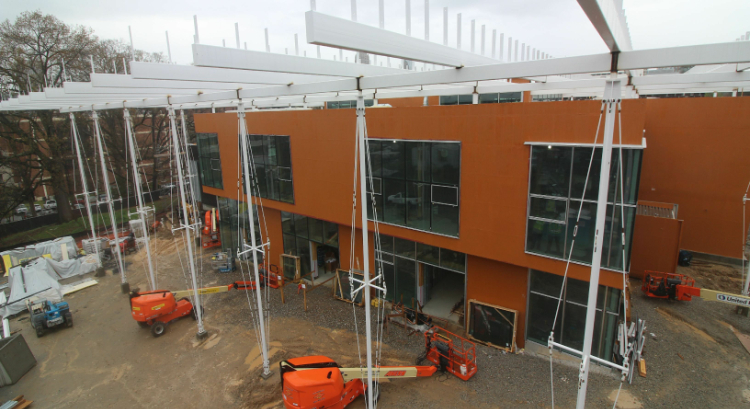 Hunter acknowledges that increasingly stringent code requirements have driven Kawneer and its competitors to improve their thermal performance, and he expects that trend to continue to push thermal performance higher. At the same time, he hopes the investment in such areas as recycling and toxic-free materials has established the company’s position as a sustainable market leader. Manufacturer: Headquartered in Norcross, Ga., Kawneer is part of the Building and Construction Systems unit of Arconic Inc., a New York-based company that specializes in lightweight metals. 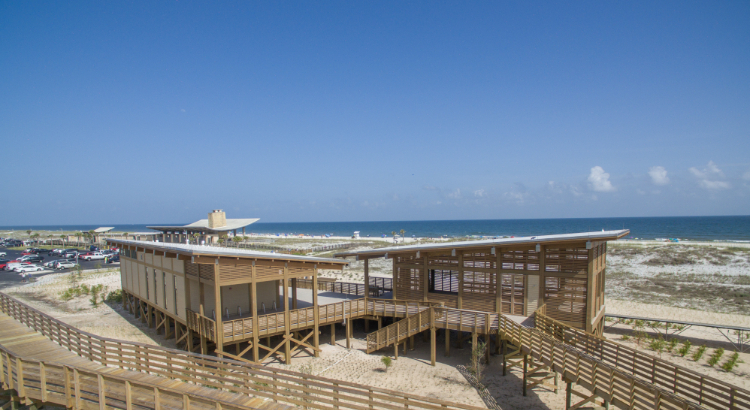 Kawneer manufactures a broad range of architectural aluminum building products at five plants in North America. 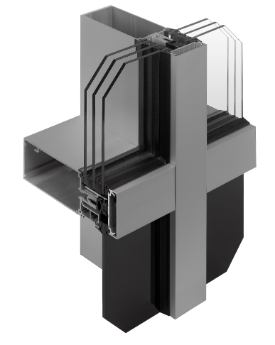 How it works: Mullions for the curtain wall are primarily composed of hollow aluminum. By increasing the thickness of a synthetic polyamide material within the mullion, the 1600UT System improves its thermal performance by 6-8 percent. The overall dimensions of the 1600UT System are no different from those of the more commonly used 1600 Wall System. Worth noting: The 1600UT System may be Kawneer’s curtain wall of the future. Kawneer Global Product Management Director Donnie Hunter expects code improvements to continue to require improvements in thermal performance. Certification: Conforms with Declare label, Global Reporting Initiative Sustainability Report, LBC Red List, UL Environmental Product Declaration and Well. Corporate sustainability and responsibility: Parent company Arconic ranks higher than 61 percent of global public companies on a variety of sustainability and responsibility metrics, according to CSRHub. 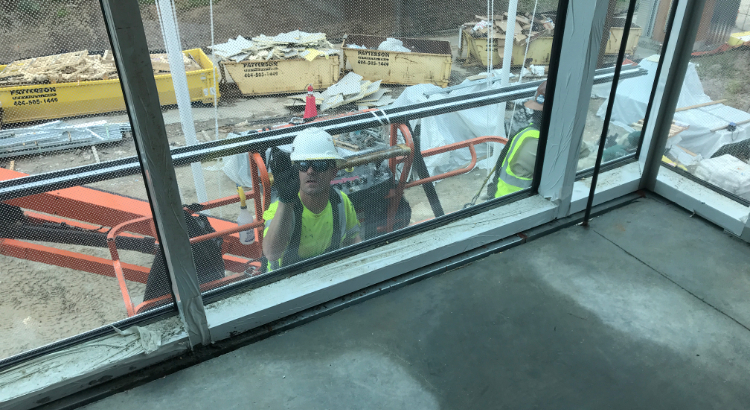 PHOTO AT TOP: Working from a lift outside the building, Installers for CrownCorr put the finishing touches of a Kawneer curtain wall at the Kendeda Building. Photo by Ken Edelstein.